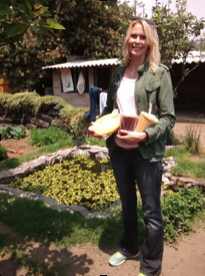 Which product of the hive is an amazing immune-booster, cold and flu remedy, and even dental therapy? If you answered propolis, you are correct! Propolis helps calm the histamine release associated with seasonal allergies, assists with various dental problems, systemic inflammation, and anywhere antioxidants are needed. Propolis is one of the most researched honeybee products, second only to honey. It has been found to be protective of both the liver and the kidney[1,2], beneficial in the treatment of nail fungus and warts, useful in managing the pain of neuropathy, is neuroprotective related to systemic inflammation and neuroinflammation in neurodegenerative diseases, and has potential merit in protecting and reducing BPH levels in elderly men. “Propolis has shown efficacy against brain, head and neck, skin, breast, liver, pancreas, kidney, bladder, prostate, colon and blood cancers.” One invitro study found that propolis (Brazilian Green Propolis) kills colon cancer cells. In a comparative assessment of Columbian samples, propolis was also found to be cytotoxic (antitumor) toward osteosarcoma (bone cancer) cells. A substance with all these health benefits (and more) warrants consideration by the holistic health professional. 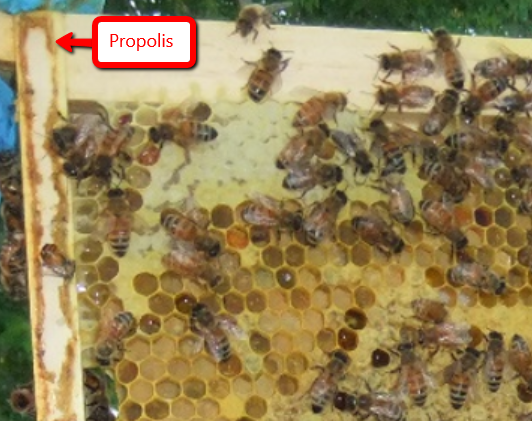 So where does one find propolis? Well the word ‘propolis’ given by the Greeks, is very telling. Translated, the “pro” part of pro-polis means ‘before’ while “polis” is the word for city. Therefore, pro – polis means “coming before” – “the city” of the bees. That is exactly where this sticky resinous substance is found. Before the colony of bees. Industrious little creatures that they are honeybees use this sticky, resinous, antimicrobial substance to coat every bit of the interior of the wood that surrounds their hive chambers. If there are openings or cracks in the surface surrounding the hive, the bees will fill them with propolis. No one accesses the interior of a hive without first having to cross this disinfectant, antimicrobial layer. It indeed comes before the city (dwelling place) of the bees. 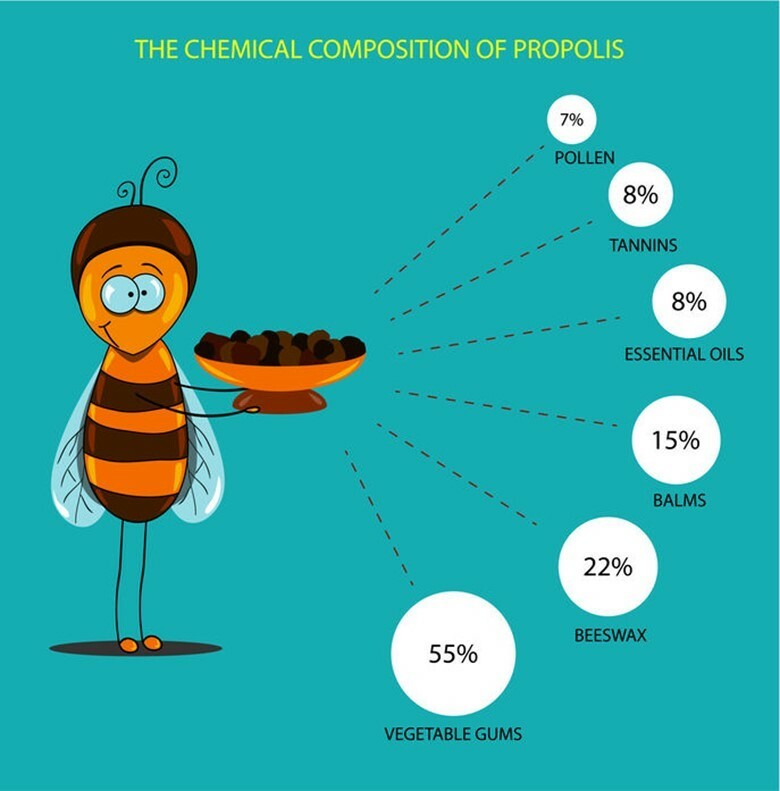 But what is propolis? The amazing substance is called bee propolis or “bee glue,” to which propolis is sometimes referred. It is yet another amazing substance crafted by honeybees. In the early spring, especially, honeybees gather a resin-like substance from the buds of poplar and conifer trees. Honeybees make this substance by mixing beeswax with the resins along with essential oils from plants and their own salivary secretions. The bees then use propolis to cover the interior of the hive, make repairs, and patch holes. It is sticky, and caramel to reddish or brownish-colored. When it freezes it hardens, becomes, brittle, and loses its tackiness. When it is warm it is pliable, glue-like, and very sticky. Think… toffee! There are beekeepers who upon examining a hive early in the spring, have found an expired mouse to be completely encased in propolis. Apparently, the wary little travelers enter the hive to find warmth in the winter and subsequently died. The bees (smaller yet) and unable to remove such a large creature from their hive, did the next best thing. They encased it in propolis to prohibit the decay from adversely affecting the colony within. To collect propolis, beekeepers scrape it from the interior of the beehives. If they did not the industrious honeybees would invariably glue everything in the hive together, making it extremely difficult to harvest honey and check on the general health of the hive. 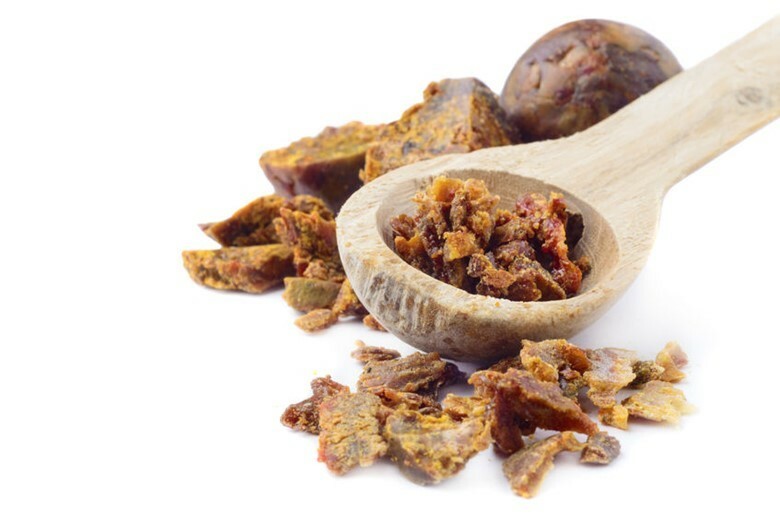 The ancient Egyptians, Romans, and Greeks, used propolis as a healing medicinal. “The ancient Jews considered tzori (the Hebrew word for propolis) as a medicine. Tzori and its therapeutic properties are mentioned throughout the Old Testament. The biblical Balm of Gilead (tzori Gilead in Hebrew) is nearly indistinguishable from propolis.” The knowledge of the healing properties of propolis fell into obscurity during medieval times with only limited awareness passed on in traditional folklore. Fortunately, the lowly beekeeper held the mysteries of the honeybee close to their heart. It was not much more than a century ago that scientific research on propolis began to prove the healing properties of propolis. To date over 180 chemical compounds have been identified in propolis and it is a confirmed antibacterial, antiseptic, anti-inflammatory, anti-fungal, and anesthetic agent. Propolis. A potent, natural, healer. As an immune-booster, propolis increases the quantity of immune cells along with their immune-boosting activities. It also increases the production of antibodies, activates and increases the number of macrophages and their responsiveness and ability to kill bacteria. It also increases natural killer cell activity. “A number of [cold and flu] symptoms have been found to be relieved with the use of propolis, including fever, headaches, body aches, coughing, and sneezing, demonstrating surprising effectiveness at this. Also a Russian study of 260 patients saw a reduction in sore throats and coughs in 90% of cases. Propolis “plays well with others” an Israeli study of 400 children revealed. A combination of propolis, echinacea, and vitamin C were utilized to shorten duration and lessen severity of symptoms.” It has also been found helpful as an ingredient in a nasal spray for sinus infections. In dental applications propolis resin, warm and pliable, can easily be packed into a tooth. A small piece of the resin itself can be placed in the mouth near the point of concern and left between the tooth and the cheek. Propolis tincture is most frequently used as a mouth rinse when addressing inflammation of the gums and for general mouth health. In an intervention group where patients were given propolis, researchers found that those patients had a significantly lower risk for severe oral mucositis. There are literally thousands of studies documenting the health benefits of propolis, only a few of which have been presented here. Like other products of the hive, any chemicals introduced to the hive such as antibiotics, fungicides, miticides, etc., will toxify the entire hive, including the propolis. Be sure the propolis you use medicinally is high-grade propolis and that chemicals were not used in the keeping of those bees. Beebread! Who knew? With a name like that it’s not hard to imagine all those little honey bees scurrying around the kitchen wearing their teeny-tiny aprons and their teeny-tiny Toqués. Yes. While that is easy to imagine, it is slightly more difficult to shake that image from one’s mind and come back to reality. Pollen is the male seed of the plant located in the flower which is required for fertilization and subsequent seed development. It consists of a minute particle of 50/1.000-millimeter corpuscles which form at the free end of the stamen. Every flower has pollen and this pollen provides about 40% of the nutritional needs of young bees.